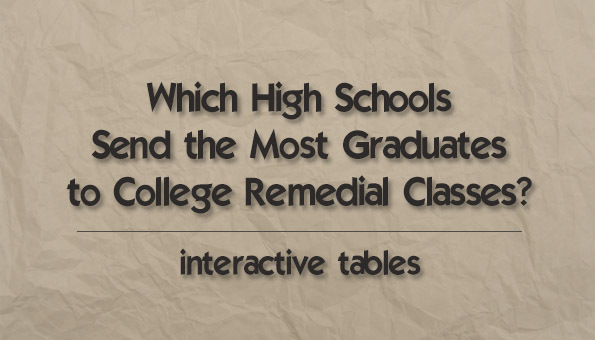 Alabama School Connection » Which High Schools Send the Most Graduates to Remedial College Classes? Of the 23,000-plus class of 2014 high school graduates who enrolled in an Alabama public college or university, nearly one in three found themselves not prepared to move straight from high school into college math or English classes. The percentage of students enrolled in remedial math and English courses actually increased just a bit from the 2013, rising from 31.8% to 32.1%, despite the remediation rate being a primary focus of the Alabama State Department of Education’s (ALSDE) Plan 2020 strategic plan. 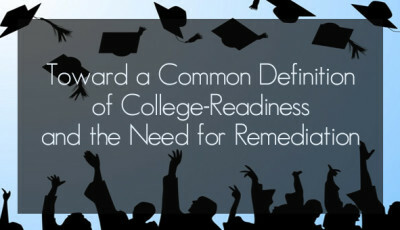 There are many costs involved when students take remedial courses in college. Retaking high school coursework in college costs Alabama’s students more than $18 million in tuition and fees* with much of that being paid with federal financial aid. Those costs are just for the graduates who attend college here at home. No figures are kept for students leaving Alabama to attend college in other states. It’s not just the immediate dollar cost that should catch your attention, though. Research also shows that students who take remedial classes are less likely to ever graduate from college. And remember, too, that remedial coursework does not earn college credit toward a degree. 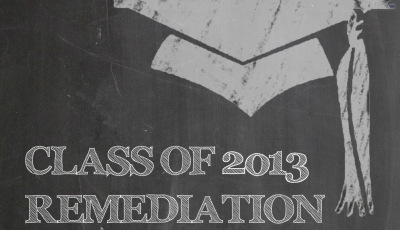 A Common Definition of Remediation? Alabama’s State Superintendent Dr. Tommy Bice has repeatedly said that until there is a common definition among Alabama’s 25 community colleges and 14 public 4-year colleges of when remediation is needed, any meaningful reduction in the remediation rate will be difficult. 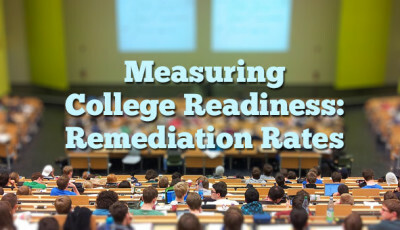 In lieu of that common remediation definition among postsecondary institutions, Alabama adopted the ACT benchmarks to determine college-readiness. In other words, if students score above those benchmarks on the ACT, they are considered college-ready and theoretically should not need remediation. But a quick look at one popular university’s placement guidelines shows that students with ACT scores below 20 in English and 23 in Math are required to take a placement exam that theoretically could land them in a remedial class if they don’t score highly enough on that placement test. ACT’s benchmarks for college readiness are 18 for English and 22 for Math. Another popular university has changed their math placement test requirement beginning with incoming freshmen this Fall. In years past, all entering freshmen were required to take a placement exam regardless of their ACT score. Which theoretically could have landed them in a remedial class. If you are sending a freshman to an Alabama college this year, make certain you and your child understand the placement test requirements, if any. Make certain you know when those placement exams are given and whether students are allowed to take the placement test more than once. The Public Affairs Research Council of Alabama (PARCA) published an interactive tool to allow you to select a high school to view the remediation rate by percentage, along with more in-depth information about remediation rates in Alabama. The numbers below allow you to choose a school district and see the actual number of students from those high schools who were enrolled in either a remedial math class or a remedial English class, or both. Here are the percentages, presented in the same format. The average number of students in an Alabama high school graduating class was 127. The median number of students (which helps eliminate the effect extremely large or extremely small high schools have on the average) in an Alabama high school graduating class was 96. The number of students in an Alabama high school graduating class ranged from 11 to 600. *This figure was arrived at by multiplying the number of remedial classes taken by the class of 2014 (10,187) times the average cost of a 3-hour classes ($1800, the figure used by A+ Education Partnership when quoting savings for families of children passing Advanced Placement exams). The actual calculation comes to $18,336,600. UPDATE: September 19, 2015: When further broken down by 2-year and 4-year colleges, that cost comes closer to $10 million. We found that 7,996 of those 10,187 courses were taken at the 2-year college level and 2,191 were taken at the 4-year college level. The cost for a 2-year college course is approximately $700, while the cost for a 4-year course is approximately $1800 as stated above. The new calculation is (7996 x 700) + (2191 x 1800) or $9,541,000. The Google spreadsheet and Tableau data have been corrected. I initially failed to separate those schools that had duplicate names. I regret the error. My sincere appreciation to the reader who brought this to my attention.